A new year will begin in three days. The passage of time has a special meaning for birders. But while we’re deeply attuned to the seasons or the near-clockwork predictability of arrival and departure dates, it’s the Gregorian calendar year of 365 days that imposes the strictest temporal boundaries on this hobby. For listers, annual lists reset to zero at midnight on January 1st with Sisyphean reliability, sending these compulsive birders out at the first light of the new year – or earlier – to tick a new round of first-of-year birds to begin the entire obsessive process anew. The most competitive of all undertakings in birding is the big year, a quest to see as many birds as possible within a single calendar year. Migration is a regular, annual event, often requiring radical rearrangement of personal schedules every year. We even learn how to age some birds by the plumage they acquire after certain numbers of years in the world. Of course, the year is also an important measure in the world of drink. Many wines and spirits are described in terms of vintage or years spent aging, and this information is often essential for understanding the origin, quality, and even legal definitions of a particular style. Most beers, being less well-preserved due to their lower alcohol content, are less often allowed to reach their first birthdays and beyond. But while most beers are enjoyed fresh, a handful can benefit from careful maturation last years. Beers reserved for the cellar are generally the strongest, darkest, and maltiest of styles: the heaviest stouts, the most potent Belgian dark ales, and old ales and barleywines, two similar English styles historically brewed on account of their imposing richness, strong malt flavors, and warming, wine-like alcohol levels. As in wine, the years spent in the cellar can have an enriching effect on a beer, perhaps mellowing its rougher edges, rounding out flavors, or allowing qualities muted in its youth to shine through as it matures. Serious drinkers will even engage in “vertical tastings”, in which several vintages of a beer are tasted in chronological order in a single session for a year-to-year assessment. I only had one bottle of this week’s beer – a barleywine – so there was no vertical tasting, but at 10.5% alcohol by volume, three-quarters of a liter of strong ale was more than enough for me and my drinking companion on a weeknight. 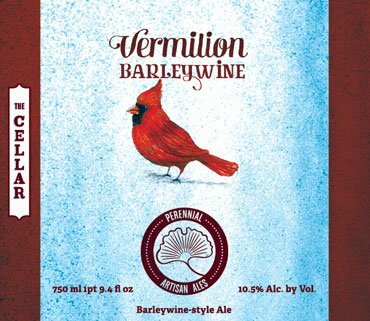 Vermilion Barleywine is brewed by Perennial Artisan Ales of St. Louis, Missouri as an annual special release. My bottle was brewed in December 2014 and given to me a gift, and it’s been sitting untouched ever since – out of sight, but never completely out of mind. Three years is fairly old for a beer, but I had faith that this durable beer would hold up and my patience would be rewarded. Barleywines can be enjoyed while young, and some say they’re at their best after five years or so, so splitting the difference seemed a sensible choice. And there’s a bird on the label, which only heightened the urgency of trying this beer after such a wait. According to Perennial Artisan Ales, Vermilion Barleywine owes its name to the claret tints this beer displays when held to the light. 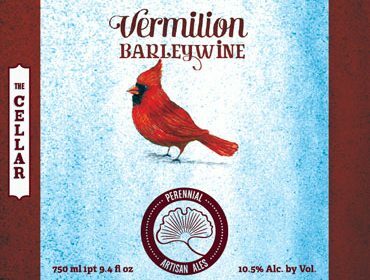 North American birders spotting the word “vermillion” in a beer review here might reasonably expect to find a Vermilion Flycatcher (Pyrocephalus rubinus) on the bottle, but instead we get the much more familiar Northern Cardinal (Cardinalis cardinalis) with Vermilion Barleywine. I could quibble about this, but this beer is a decidedly heavy, wintertime sipper, much better marketed with a picture-perfect cardinal sitting in a snow-covered field than by the arid, southwestern haunts of a flycatcher that barely winters in the United States. Perhaps the brewery also wanted to avoid any unhappy associations between beer and flies (there’s a reason beer steins have those funny flip-top lids), though I find the tyrant flycatchers the beeriest of all avian families, with the Olive-sided Flycatcher’s pushy “Quick! Three beers!” demand, and the Alder Flycatcher hawking “Free beer!” when it isn’t busy hawking insects. 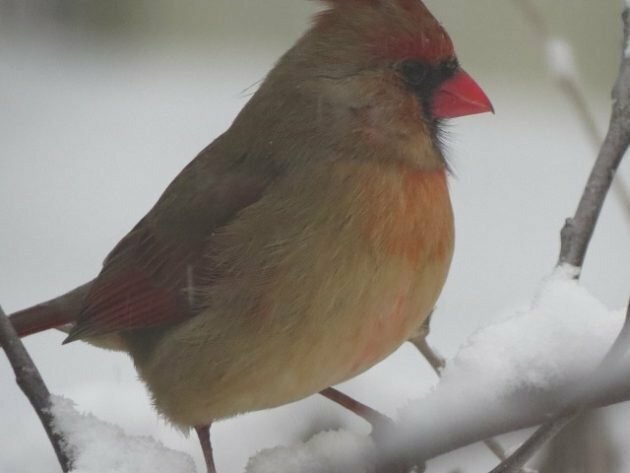 Be that as it may, this is the first time we’ve seen a beer with a cardinal on it – a somewhat surprising first given the species’s popularity as a logo and mascot. Hmm, this one’s not vermilion at all. I found the promised reddish shade of this barleywine less brilliant vermilion and more of a deep, warm maroon, tinting the edges of a dark russet beer crowned with a foamy, taupe head. The aroma is wonderfully layered, with a deep foundation of dark chocolate, fig jam, and molasses, topped with softer traces of oven-browned bread pudding, caramel, and toasted walnuts. A toffee fruitiness suggests bananas Foster, and there are slight touches of holiday baking spices, but no hop aroma to speak of – though I suspect this beer had some in its younger years. On the palate, this barleywine boasts a creamy sweetness that recalls rum raisin ice cream, tempered by the nuttiness of a dry sherry, with hints of licorice and warming alcohol. The mouthfeel is rich and velvety, drying out in the finish with bittersweet cocoa and a touch of woody maple syrup. 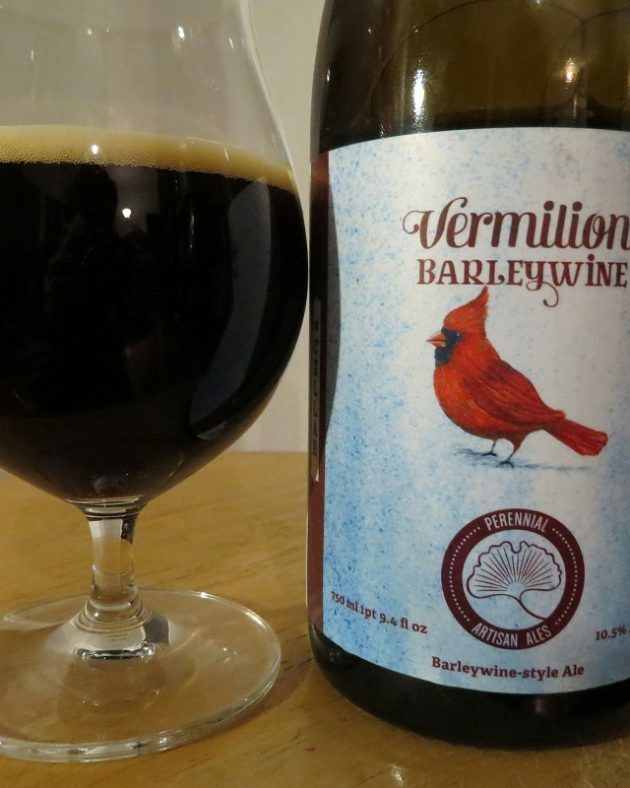 Vermilion Barleywine is a rich, warming treat for any cold, winter’s evening, but if you’ve taken care to vintage a bottle for a few years, it’s worth saving for a special occasion. A beer as bold as this can be paired with care with other strongly flavored pleasures that would overpower weaker draughts: sharp, salty blue cheeses like Stilton and Roquefort, cigars, or very rich, sweet desserts. And while it’s not the traditional Champagne, there’s nothing to say you couldn’t enjoy a good, aged barleywine as a nightcap on Sunday after ringing in the new year with the bubbly stuff. Happy New Year and good birding in 2018! Tempus fugit. Rehabber Slang Part 2, etc.